Great Job on The Laundry! In Recognition of Your Achievement…..
” SO and SO is hogging the bathroom.” We have others- is there a reason why only that one will do? So imagine my elation when I was offered a well manicured hand to pull me from the domestic fringe where I hung by my dish pan hands, cuticles frayed, rubber gloves worn through at the tips. Now when people ask me what I do in Japan, instead of my customary answer of “Nothing,” I can (honestly) answer, ” Well, I write an award-winning blog,” or “I”m an award-winning author.” I’ll be working on more equally nauseating responses now that I’m in the winner’s circle. Thank you Kate Allison over at the Displaced Nation! When Kate gave me the award she was writing her own blog but disaster struck and she pulled up stakes. She is a regular contributor of feature articles at Displaced Nation and writes an ongoing story called “Libby`s Life” about a British ExPat relocating to a New England town which forces all the monsters from the family`s past out of the closet. Here Kate highlights her faves- which is the benefit of the blogging awards. Finding new fodder. In keeping with tradition, I must list 7 facts about myself. They may or may not be true. Then on to highlighting 7 other blogs that routinely make my “Must Read” list. 1) I really am that mean to my Offspring. It’s character building. Spouse is nicer. 2) I am currently on a family tour of duty in the US where I am busy evaluating guest bath room amenities. Awards and Demerits will be distributed later. 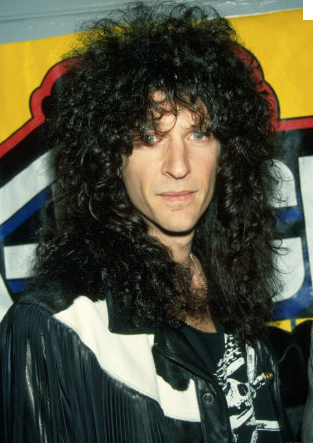 3) Howard Stern is my celebrity look-alike. 4) Offspring #1 had a broken arm for two weeks before I took him to the doctor. That was several years ago before I had several broken bones under my belt. 5) One of my aunts is a famous psychic. 6) I had 6 toes on one foot until I finally had one surgically removed. Offspring #2 says that even without the 6th digit, I`m still a witch. 7) I was once pictured as a “Fashion Don’t” in a magazine wearing leggings and turquoise cowboy boots. So, now that you are all busy trying to figure out fact from fiction, on to some of my favorites. 1) Author Piper Bayard– Piper writes a weekly mash-up where she adds content from all over the internet. I always find two or three new folks to follow. Her writing partner, Holmes, has caused my brain to grow as he has explained the mysteries of history. 2) Kristen Lamb’s Blog– An expert in social media and past literary editor- Kristen will teach you how to write, and blog, and twitter, and FB, and unFB, and lots of other things. And entertain you while learning you. 3) I Heart Mondegreens– Michi is a Californian living in Spain. She was just Freshly Pressed for the second time. Great stuff. 4) Reinventing the Event Horizon– Ever wondered what it was like to be the daughter of a mob boss? Well, Kathy is and she’s writing about it. Fascinating. 5) Taste of Japan I have just found this blog and must admit I have mixed emotions. Mostly a mix of jealousy, envy, there must be a green-eyed monster on my back, and covetous- of my readers flocking to Taste of Japan. Stunning pictures along with great explanations. I feel that by recommending this blog I can cleanse myself of these issues. 6) Childhood Relived Angie is one of the funniest folks on WordPress. The comments are usually as funny as the post. Angie roots around her childhood finding all sorts of things to skewer. 7) Unbrave Girl The Chinese get a bad wrap but Sally is changing that one hilarious post at a time. Traveling Asia and blogging about it while keeping readers entertained is her forte. Kudos to Sally- I`m hooked. Normally, I would spend a lot of time re-reading and proofing this post. Right now, I`m in a Starbucks with Grandmama since the internet at our eco-condo on the banks of a mosquito breeding pond was just a rumor. I`m in a hurry. She`s closed her Kindle and is now staring at me. Now she`s putting on her lipstick. Better go. Stink eye and thin lips. See you soon. This entry was posted in Moving to Japan and tagged Amblerangel, Culture, Emily Cannell, ExPat, Family, Hey From Japan- Notes on Moving, Humor, Japan, Moving, Tokyo, Travel, Vacation, Versatile Blogger Award. Bookmark the permalink. 14 Responses to Great Job on The Laundry! In Recognition of Your Achievement…..
You are truly award winning!!! Congrats! and thanks for some ideas on child responses. I especially like..it is not a restaurant. Eat it or wear it! Thanks dear! Hope you are having a great summer Chris! Thanks Emily – today’s FITFS is you. Thanks for all you do that makes our day that much better! NIce to meet you Jackie! Congrats on the honor, Emily, and thanks for passing it along to me. What’s cool about this, is I have never read any of the other award recipients. Some of these look fun! Thanks for the recommendations! Happy 4th of July, my friend. We’ll miss you here in Kentucky this summer! I`m so glad you are ok! That was quite a fall you took! Scary! I know- I wish we could have come through. The Nose was in Chicago. I loved learning all of these behind-the-scenes tidbits about you! # 3 cracked me up. We curly-haired girls from the South are all in the same boat, aren’t we? So true. I really did love my curly mullet- kept the frizz off my face and it could just get as wild as it wanted. I still giggle every time I hear you refer to Howard Stern as your celebrity lookalike. I still haven’t figured out my own celebrity doppelganger… suggestions? I haven`t been privy to the celebs in a while- I have to get back to the US so I can follow the tabloids again- then I`ll match you up. For better or worse…. Congrats, Emily! I love your build-up about how staying at home never earns any awards. Do boogers count? My son is a champ about giving me those, and I know he values them so it must be an honor? Your personal unknown facts might be the most interesting ones I’ve ever read on WordPress! I can’t believe you made the fashion don’t list! You’re so lucky just to be in the mix! And psychics are near and dear to my hear. My only psychic encounter included the alert that I’d one day meet a dark-haired man named Mark who would be very special to me. Two years later I met my dark-haired husband Mark. Thank you for such a kind shout-out! Angie- You truly are one the of funniest blogs around- the picture critiques are hilarious! Keep it coming!